Any chronology of China’s post-Great Recession descent follows exactly that relationship. US economists are quick to assert a break, where the US economy has surged since the unemployment rate is so low but China’s economy, which certainly feels instead the effects of the denominator in the unemployment rate as much if not more so now than the statistical outlet of the numerator, begs to differ.  Starting at the trough of the Great Recession, all economic expectations here and abroad were based upon Milton Friedman’s plucking model – the beautiful symmetry of the V-shaped recovery. 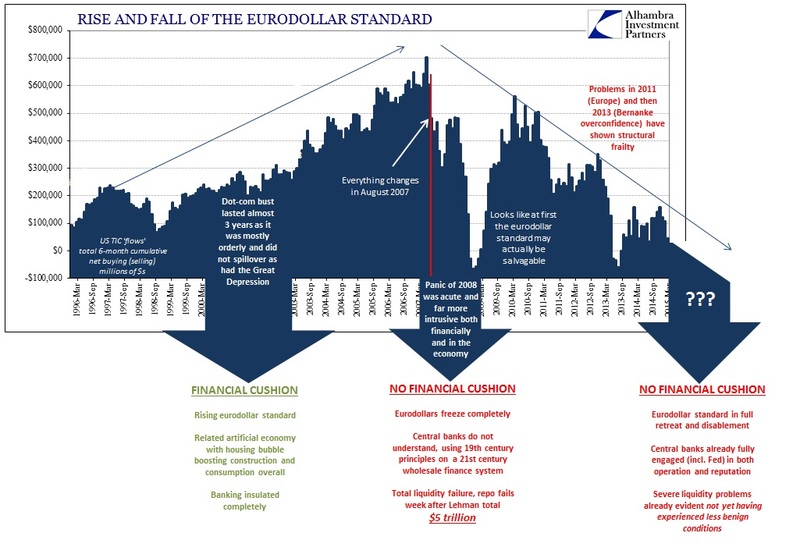 There were no suggestions of long-term difficulties or structural problems in the orthodox view of even the panic, so every central bank around the world engaged “stimulus” (combined with various fiscal attempts) to bridge the gap between the deep recession and the expected handoff to an organic, symmetrical recovery. In China, those efforts were greater than most, both monetary and fiscal, as the entire marginal economy had come to service the export-driven emphasis. 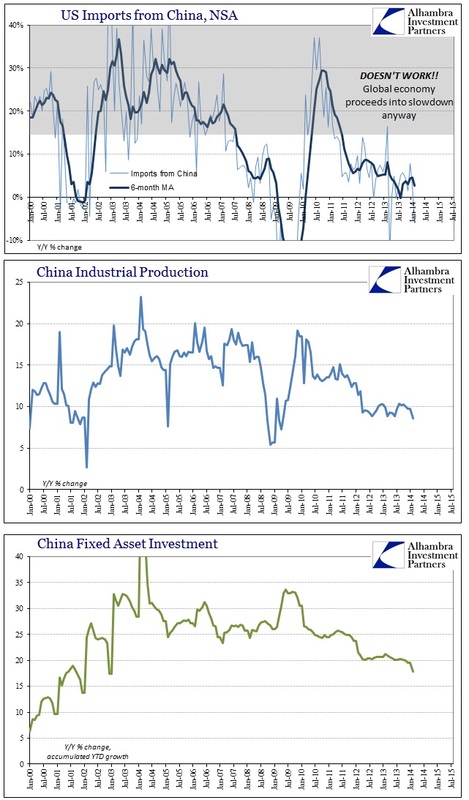 Thus, in China’s view of the Great Recession, industrial production followed US import activity but fixed asset investment was mostly stabilized (“stimulus” at “work”). Despite renewed financial doubts in 2010, everything seemed to be working as intended and expected; not just in China, but globally. By early 2011, there was confidence enough to actually unwind (especially Europe and China). But those financial irregularities suddenly and “unexpectedly” turned into economic retrenchment by early 2012. 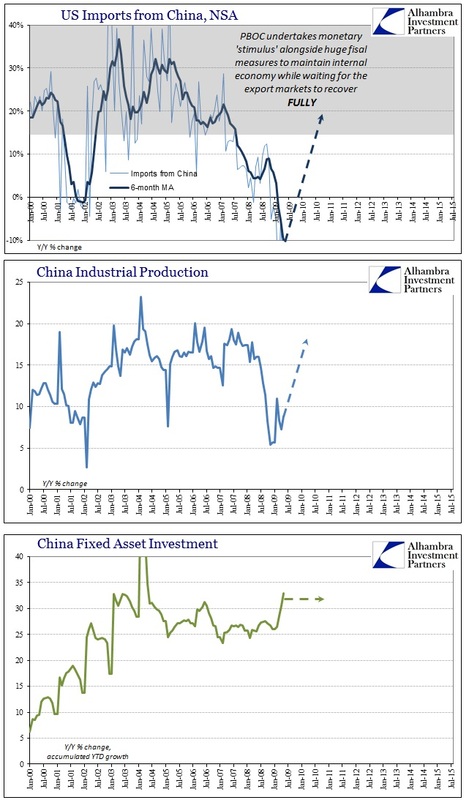 So central banks did what they are “supposed to” and renewed all the “stimulus.” China’s government unleashed a massive spending program (RMB 1 trillion) while the PBOC aided in outward rate cuts and more directed “easing” aimed at a general flooding of financial conduits. 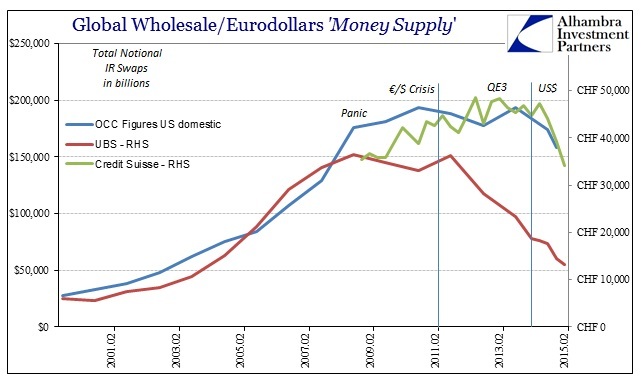 The US Federal Reserve, for its part, engaged more QE, a third then a fourth in quick succession. All of it aimed, as that in 2009, to restore these economic channels to 2007 levels; and it was assumed that everything would follow since this was, as the Great Recession, viewed as another temporary deviation from the plucking trend. It did not work anywhere. 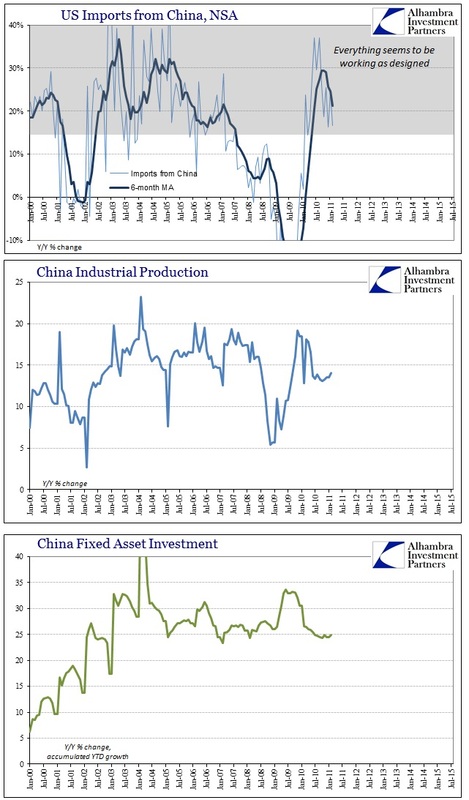 China was the first to figure out, after two huge tries, that it would never work and getting back to 2007 was no longer possible for the global (and US) economy. Because its imbalances were so large, and bubbles so dangerous, it did not have the luxury of hanging on several more years to see if it all might come together at some point. The irregularity of the European and US economies since 2012 were just more confirmation for the theoretical motivation of this new “reform” agenda. For China, reform means letting the economy go where it may while focusing as much effort as possible on potentially managing a financial reversion that hopefully does not end in total financial (and economic) disaster. 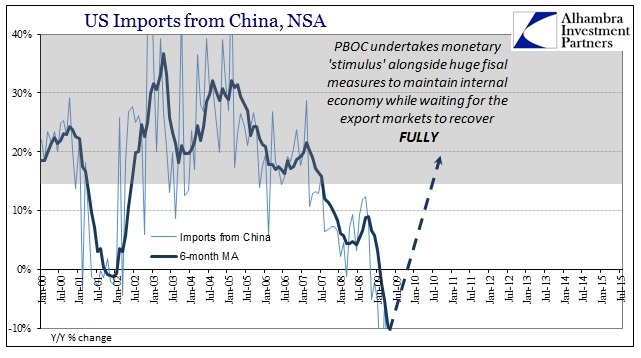 While that is China’s end of the problem, it must be emphasized that it begins with the US’s distinct and continued lack of “demand” quite apart from what is suggested by the Fed’s public statements (though confirmed increasingly by its contradictory inaction). 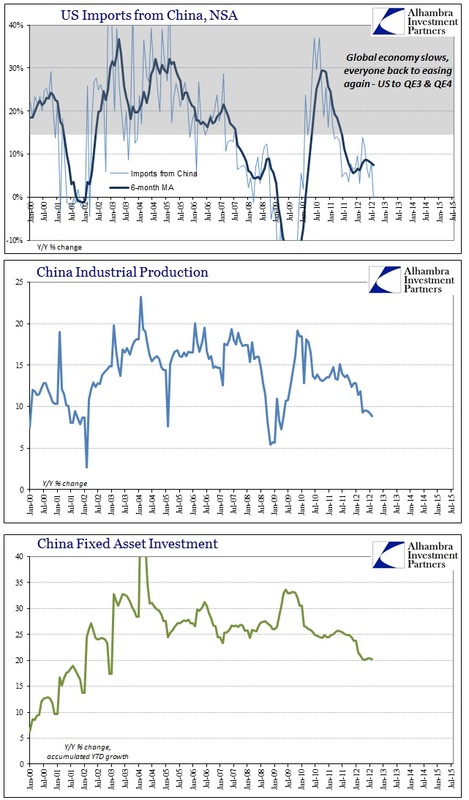 Without either US growth or internal “stimulus” pushing further bubble imbalance, the Chinese economy is winding down toward an unknown but likely dangerous fate. 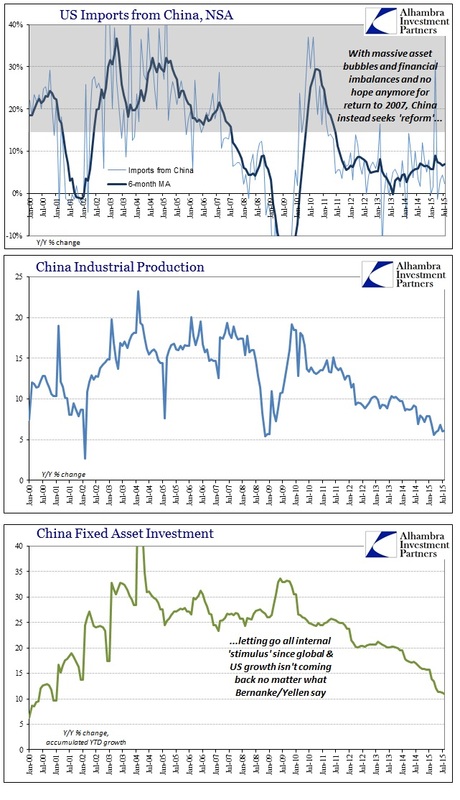 Since so much of the rest of the global economy is tied in with China as the manufacturing nexus between resources (EM’s) and end markets (US, Europe), this succumbing to economic reality is the pivot between US economic decline and the world’s; their economic trouble is our economic trouble, both cause and reverberating effects. All that is left is to assign a single cause for the second deviation (which is really the same as the first); something powerful enough to burn to ashes all the massive monetary attempts the world over.